Thank you to Hypnobabies Instructor Heather Comparato for sharing her student’s story with us. I have never been the type of person that wanted a natural birth. The thought of it just terrified me. I saw it as the worst experience that I could ever possibly imagine. Why would any woman choose to do that to herself when she had the option to have pain medication? Over the years and giving birth to six kids, I had tried a handful of pain medications from Demerol, Staydol, Nubain, and three Epidurals. All of them had left me feeling dissatisfied with my birthing experiences and even disconnected from them. I felt as though I hadn’t been able to adequately participate in my epidural births and as though I had been just floating in some far away land unable to find my grounding in my other births. Another driving force for my desire for an unmedicated birth was my increasing intolerance to medications in general. I had experienced some scary adverse reactions to several different kinds of medications and pain relievers. So I wanted something more this time. I wanted to have faith and trust in my body’s cues. I wanted to allow my body to guide my baby and I into and through the birthing experience. I cried on several occasions thinking about my decision to trust my higher power, God, and take this huge step. I was scared, but I knew that it was what I wanted in my heart. I had no peace about using pain medications. It didn’t feel right to go down that road again. But I knew that if I was really going to go make this successful and follow through with it that I was going to need to prepare and commit myself mentally. So I began looking online for all types of childbirth classes. I found a few options that seemed interesting, but after looking into them further, I decided that they didn’t sound like the right thing for me. And then I came across Hypnobabies. Now this seemed like an interesting concept. One that I could see myself trying. And so that is where my Hypnobabies journey began. I first talked with my Hypnobabies instructor, Heather Comparato, in February 2015. My due date was August 14th. I had plenty of time. For once I was being proactive and I felt good about that! We had an amazing conversation over the phone that left me feeling positive and hopeful. 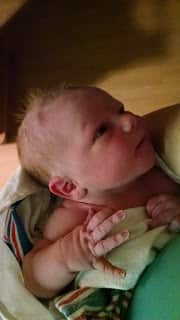 We talked about my past birthing experiences, what I was hoping for in this birthing experience, my fears, and many other things. What stood out to me most about my conversation with Heather was that she continued to remind me that this was a new baby and a new birthing experience. That was huge to me. Suddenly I realized that just because my other births had problems and weren’t altogether positive experiences, it didn’t mean that this birth had to be the same! I signed up to take the 6 week course at Mercy Hospital in Saint Louis with Heather. This was going to work out and I couldn’t wait to get started! April rolled around and my husband, Paul, and I started the 6 week course. I really enjoyed our 1.5 hour long car rides to STL every Thursday. It gave us time to talk and be together – just the two of us! As a hard working farmer, I knew it was hard for him to bring himself to be committed to this adventure every Thursday night. I remember that he would watch the fields out the window as we drove down the Interstate watching the spring field work underway. We also had our own field work to be done at home and I appreciated every minute that he chose to put into this with me. The Hypnobabies class itself was always lots of fun. I really enjoyed being in the presence of others that were learning and preparing for this amazing experience right alongside with us. I often felt a little envious of all of the first time moms in our class. They were going into their birthing experiences with a clean slate and no negative experiences to drag them down. Heather was so talented as a teacher. It was easy to become relaxed in the beginning of each class listening to her soft voice during our “blue” exercise. I think I miss hearing that today! Many of the things taught in the class were things that Paul and I (as parents of 6) already knew. But we both found ourselves learning and understanding even more about the birthing experience. This was when I realized that a majority of my fear of childbirth had stemmed from a lack of education and understanding of how my body worked during the birthing process. Even for seasoned parents, it was a good informative class. I enjoyed our birth partner pact and the in class Hypnosis practice the most. I grew somewhat attached to the other couples in our class and I was saddened to see the class come to an end in May, but I was feeling excited! I spent a good share of the summer practicing my Hypnobabies. I still had a good three months before our big day and I tried my best to stay diligent and not let it become rusty in my head. My favorite tracks were Deepening and Hypnotic Childbirth tracks #1 and #2. I also occasionally favored Fear Clearing when doubts and fears would find themselves creeping into my head. At the end of July to the 4th of August we were consumed with our County Fair. We like to take a variety of animals for our kids to show such as Beef, Dairy, Rabbits, and Sheep. And this year was even busier as our oldest daughter actually got to participate in the Jr. Miss pageant! Between 3 kids showing, the pageant, and our dairy farm at home we were booked…solid. I had little to no time that week to keep up with my Hypnobabies and I was beginning to worry that our baby was going to catch me off guard and make an early appearance. I just kept telling myself that this baby will stay put until I am mentally and physically ready after the fair is over. Several people jokingly doubted that I would make it through and told me that we would be having our baby early for sure. Bubble of Peace. That was all I needed. I knew my baby could and would stay put. The fair went very well for all of the kids and thankfully I was still pregnant. So over the next ten days I began to pray before each Hypnosis session and put in as much time as possible with Hypnobabies. I knew the time was coming soon! I was looking forward to my birthing time because I had so many positive things going for me this time. My support system was better than it had ever been before. I had a very understanding midwife that could relate to my want and need for a natural, peaceful, and uninterrupted birth. I had a supportive husband that was prepared with all of the Hypnobabies knowledge and would be right there with me to help guide others around us during our birthing time. And I had a great CLC friend who offered to be at the birth as well and help out in any way that she could. I was feeling more excited than ever to start this process and see what I was really capable of! August 14th came and I had no signs of baby coming that day. I had only ever gone past 40 weeks once before. But I stayed happy and content with my pregnancy. As much as I was growing more and more uncomfortable each day and anxious to hold my baby, I still treasured holding my sweet little baby on the inside. So we waited patiently… and I mowed the yard. When I woke up on the morning of the 15th I felt different. I hadn’t been able to get comfortable and hadn’t slept very well the night before. Pressure waves were coming inconsistently and mildly. I got up and went about my day. Outside to milk cows and other chores, back in the house to clean up, and then lunch time. At that point the pressure waves were growing stronger, felt more centered in my abdomen, and required more of my attention when they came, but were still very inconsistent. Sometimes they would be spaced as little as 5 minutes apart while other times they were spaced up to an hour apart. So I didn’t think I could be sure that this was the real deal yet. I was tired, having not slept well the night before. At 2:30 pm, I laid down for a nap with my 2 and 4 year old girls. As they slept I listened to my Hypnotic Childbirth tracks #1 and #2. I was comfortable, peaceful, and preparing myself just in case this was it. After that, I decided I would take a nap. I wanted to be rested in case things picked up. When we woke up, things were about the same, so we got up and got ready to go back outside for afternoon chores. I decided that I needed to mow the backyard again since it always seems to grow faster and get away from me. My husband looked at me strangely. He probably knew that this was a sign that baby was coming. That night, instead of our regular routine of him working on other farm chores while I milk cows, he stayed with me and we milked together. It was nice to have some help since I now felt the need to stop during pressure waves in order to relax my body as much as possible. I was finally starting to think that this might be it. We finished milking and he left to feed the cows while I finished up washing down the parlor and feeding the brand new baby calf that had been born that day. We all got into the house around 10 pm and I went in for a shower. Paul now tells me that I was in there for a very long time, but it didn’t feel like a long time to me! I took a relaxing shower and worked on relaxing my mind. I was pretty sure that this was it and when I got out I would tell Paul that we needed to leave for the hospital. A few strong pressure waves came while I was in there. I got down on my knees, put my head down, and breathed my natural anesthesia to my abdomen. The water from the shower felt so good coming down on my back. After my shower, I had my one and only episode of doubt. Fear crept into my mind and I panicked for a few seconds alone in the bathroom. I questioned my ability. What was I doing and who was I kidding? I’d be better off to just get to the hospital and get the epidural right?? I quickly dismissed my doubtful thoughts and I prayed to God to help me find the strength to follow through. I CAN do this. My body was MADE to do this. I AM ready! When I got out, I had begun to shake throughout my whole body. I told Paul that we would be leaving tonight. So he and my 12 year old daughter began taking bags out to the car while I finished getting ready, sent a couple of texts, and called our friend to come watch the kids. I had to laugh when she answered the phone at 11:00 at night with a “Is it time? !” She made it over in record time. I said goodbye to the kids that were still awake. My youngest cried a little but she was happy with big sister who anxiously asked me to send her a text as soon as the baby was born to let her know if it was a boy or a girl. As soon as we got to the car I grabbed my headphones and put in my Easy First Stage track. I laid back, closed my eyes, and focused all the way to the hospital. This was our quietest ride to the hospital ever. I have to say that it was my most comfortable ride to the hospital! I found it relaxing and nice to be able to listen to a new track that I had never heard before. I had waited 4 months to hear what was on this track! When we got to the hospital, we gathered up all of our stuff and walked in. I left Paul at the ER window and sat down in the waiting room with my headphones still on. A man walked in and sat directly in front of me in the small waiting room. “That time huh?” he said to me. I smiled and closed my eyes again. Bubble of Peace…I got this. When they opened the doors and let us in the ER, I quickly ducked into the triage room to the right while Paul checked me in. Over my headphones, I could hear him answering questions for me and I was so grateful that I didn’t have to answer them. The terminology was all wrong. I could hear her asking about labor, contractions, and pain. Again… Bubble of Peace. An EMT came in and asked me if he could turn the light on for me in the dark triage room. I quickly waved and said “No thank you, I like it like this”. After checking in, we walked to the Birth Center. I was offered a wheelchair but it was the last thing that I wanted at that time. So we walked. Me with my eyes closed most of the time. I had walked this route a few times before! as well as the informative sheet of “How you can help the Hypnofamily”. Then he taped the “Please whisper, we are using Hypnobabies” sheet on the outside of the door by the door handle. Again, I was so happy to have him there to do all of these things for me! I saw the nurse reading her paper and walk over to the light switch and turn the lights off. Perfect. Instantly I felt more comfortable. I continued to sit quietly listening to my headphones and breathing Peeeeeeeace with each pressure wave. At that time, the nurse asked if she could check for dilation so that she could let my midwife know if she needed to head in or not. I said yes but that I would rather stay out of the bed. (There is something about hospital beds that make me feel uncomfortable) So we waited and in between pressure waves we checked dilation in the chair at 12:30 am. I wasn’t sure if I wanted to know, but I did ask and was very happy when the nurse told me that I was at 8 cm and 100% effaced! My midwife was called in and the birthing pool was brought into the room to start filling. We were getting so very close! Soon after that, I decided that I wanted to get up into a different position or maybe use the bathroom. My pressure waves were getting stronger and closer together now and I found myself working through them with a low moan. It felt good to release that energy that I felt was rushing through my body. When I got into the bathroom I sat back on the toilet with my arms resting on the bars on the walls behind me. A couple of times I opened my eyes and was happy to see that both my midwife, Liz, and my friend, Dora, were now there with us. I was starting to feel pushy during pressure waves and my body was involuntarily starting to push. I decided that I wanted to change positions again, so I asked my midwife if I could have a birthing ball. I asked my friend if she would be able to apply counter pressure on my back if I got myself up off of that toilet. Both of them happily agreed. The birthing ball and counter pressure were exactly what I needed. I bounced, rocked, and swayed while Dora worked on my back. It was short lived though because the urge to push was getting stronger. So at 1:15 am, I got into the birthing pool. The water was so amazing, so relaxing, and just the right temperature. I found a comfortable spot upright on my knees with my arms draped over the side of the pool. With Paul on one side of me and Dora on the other, I held both of their hands and I tried to relax my body as much as I possibly could. At some point, I asked if we could take the Easy First Stage track out of my CD player and play it out loud in the room so that I could move around in the water without being attached to headphones. Dora took the CD and was going to put it into a CD player, but nobody could find one in the room. At this point, I knew we needed to switch over to the Pushing Baby Out track immediately. We did and I put the headphones back on. I didn’t get to listen to a lot of that track because at 1:20 am I felt a pop and I told Liz that my water had just broke. As the baby descended and I started to feel more and more pressure, I got a little nervous about what I knew I had to do next. But in that same moment, Liz put her hand on my arm and told me to just relax. And just like that, without even knowing it, she had used a Hypnobabies cue…Relax with a gentle touch. I felt myself sink down into relaxation. Now the pressure waves had slowed down, but my body was still pushing baby down. I focused on not pushing any more if I could help it. I knew that this baby was moving fast and I wanted to be careful and allow time for stretching to hopefully avoid any tearing. I breathed my natural anesthesia out in front of my baby’s head. I can honestly say that I experienced mostly pressure and very little discomfort. And in no time at all, my baby was born quickly into the water at 1:33 am with little to no active pushing on my part. Just the way I had hoped for. Liz told me to look down to where she had made sure that my baby had made a safe landing on the bottom of the birthing pool. I was able to reach down and be the one to pick my baby up out of the water and bring him/her up to my chest. The feeling of absolute joy and excitement to hold my baby was indescribable. I was almost in shock that I had done it! I had birthed my baby totally and completely naturally and it had been so easy and peaceful! We then spent a few minutes looking at our sweet baby’s face, still not knowing if it was a boy or girl. I had dreamt of that moment all throughout my pregnancy and it was such a neat experience. When I finally checked to see what we had, I was surprised. It was a boy which was not what I had guessed! He was so handsome and so perfect. I sat in the water admiring my sweet little boy. We took extra time to rub in all of the baby frosting (vernix) all over his head and body. We waited for the cord to stop pulsing completely before cutting it. This was the healing and empowering birth that I had longed for. Proof that my body and mind are not broken and that I am actually better off to birth a baby without interventions. Everything about it was just as I had envisioned and created in my mind during my pregnancy. I got out of the birthing pool and into the bed for the first time to deliver the placenta while holding my baby. It delivered easily and without any pitocin. And Liz also told me that I had no perineal tear. Yay! Kipp Gannon Lynaugh was born on 8/16/15 @ 1:33 am weighing 8 pounds 6 ounces and measuring 20 inches. He is perfect in every way. A sweet and patient little guy that loves to snuggle and responds amazingly to a soothing voice. I loved my experience with Hypnobabies. It gave me the tools and knowledge I needed to create a different birthing experience for myself this time. Practice, dedication, and preparation are key to success. Even for someone who has had rough experiences in the past, it is possible to have a positive experience! I’m not brave or tough but I am now strong and empowered.